Hamas, together with Islamic Jihad, welcomes 'courageous attacks' including murder of Taylor Allen Force in Yafo. Hamas, the Muslim Brotherhood offshoot in Gaza, warmly welcomed the three bloody terrorist attacks on Tuesday which struck Yafo, Petah Tikva and Jerusalem. In Petah Tikva a man was moderately wounded but managed to kill his Arab attacker; in Jerusalem two officers were shot and seriously wounded; and in Yafo, a mass casualty stabbing took place. American tourist Taylor Allen Force was murdered in the Yafo attack and 12 others were wounded. The US issued a condemnation of the attack. But for the Hamas terror organization that holds de facto rule of Gaza, the bloodshed throughout the country was something to rejoice. "We applaud he courageous attacks in Tel Aviv (Petah Tikva - ed. ), Jerusalem and Yafo. This is proof of the failure of all the conspiracies meant to eradicate the intifada, which will continue until its goals are achieved," read a Hamas statement. Hamas announced on Tuesday that 50-year-old Fadwa Abu Tir of Umm Tuba in southeast Jerusalem, who was killed while trying to stab officers in the Old City on Tuesday morning, was affiliated with Hamas. 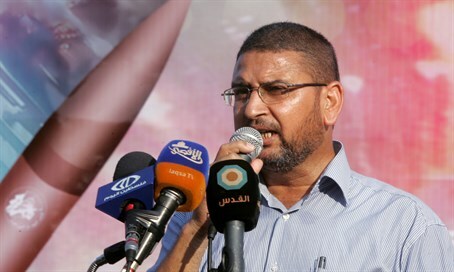 Sami Abu Zuhri, Hamas' spokesperson in Gaza, said, "the blood of the martyrs who were killed in the courageous attacks will be the fuel to escalate the intifada." Islamic Jihad, another terrorist organization in Gaza, joined Hamas in welcoming the attacks, and said that the continuation of the attacks sends a clear message to those who are doubtful, proving that the intifada is continuing and growing more intense. The attacks continued on Wednesday morning, as a drive-by shooting was conducted in the Ramot neighborhood of northern Jerusalem. An Egged bus was targeted, but fortunately none were wounded. The same terrorists then attacked near the Damascus Gate, in an attack in which a 50-year-old man was shot and seriously wounded. The terrorists were neutralized by security forces.